Our mission is to see you empowered to excellence in health, finances, and relationships and pursue your life’s pursue with all your heart. Kevin Asano and Del Fujinaka are co-founders of this 501c3. When on a mission trip in Argentina they conceived the organization and chose to reach out to others using their unique gifts and calling. Together the to “Living with Purpose” seminars and use specific strategies to bring about health, financial, and relational transformation. Find out more about Personal Transformation International. 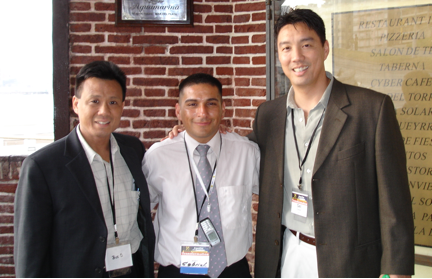 Kevin (left) and Del (right) in Argentina in 2006 with a former prisoner who was shot 16 times and lived to become a testimony of a transformed life of purpose and passion. What do we do with the rest of our lives? Much of who I am and what I have accomplished in life is a result of a keen awareness that I have a destiny that I must fulfill-a purpose that I need to pursue. Even with this understanding, in 2006 I still found myself without a clear direction and strong sense of my mission in life. I had reached the pinnacle of success in sports by competing in the 1988 Seoul Olympics in judo, but 18 years later I still was at a lost of what I was supposed to do with my life. That year a business associate and close friend, Del Fujinaka, encouraged me to go with him to Argentina to experience transformation that was taking place in the nation. I didn’t know what to expect and went mainly on Del’s enthusiasm. It was at a visit to Olmos Prison, Unit 25 (watch the documentary on the prison at http://vimeo.com/20826558) in La Plata, Argentina where I began the revelation of my personal mission in life. Can the “Garbage of Society” be transformed? Can murders, rapists, and thieves have their lives changed to where they have a purpose in life even behind prison walls? At Olmos Prison I was amazed to see hardened prisoners transformed by the power of God. If these men could find peace, forgiveness, and a new purpose in life, I wanted the same. After leaving the prison I sat in my seat on the bus that was to take us back to the hotel. What is the purpose of my life? What am I to live my life for? How can I be an impact to my world just as these prisoners are impacting their world? My heart stirred as I pondered this prison experience. As I sat alone in reflection, thoughts began to fill my mind. I quickly took out a brochure that I used as scratch paper and began to jot down words and ideas. “I am called to empower people to find their God-given calling in life and to help them pursue it with all their hearts.” These words flowed from my pen as tears began to stream down my face. In that solemn moment, I saw a glimpse into my life’s calling. It was like a light illuminating my path to make it clearer on the direction in life. This was a major landmark in my journey to discover what I was to do for the next season in my life. You do not need to fly halfway around the world to discover your purpose in life. Your purpose is already within you and as you search your heart you will find it. My hope is that this blog will empower you find your God-given calling in life and help you pursue it with all your heart.